Inspired, India won the Women’s Team title at the Gold Coast 2018 Commonwealth Games on the evening of Sunday 8th April; contrary to all predictions, they beat Singapore, the top seeds and defending champions to reserve the top step of the podium. Represented by Manika Batra, Madhurika Patkar and Mouma Das; at the final hurdle they beat the trio formed by Feng Tianwei, Yu Mengyu and Zhou Yihan by three matches to one. Against the odds and underlining the progress made in recent months, Manika Batra gave India the ideal start, it could not have been more perfect; she beat Feng Tianwei in five games (11-8, 8-11, 7-11, 11-9, 11-7), the player who at most recent editions of the Commonwealth Games has been the stone wall banker for Singapore. In a tense fifth game, at 7-all it was parity; using her blocking technique from the backhand and unleashing an ever more assured forehand top spin, as she had done throughout the whole contest, Manika Batra won the next four points to send Indian supporters into unbridled joy and caused coach Massimo Costantini to thump the air in a manner that would have won boxing gold with an upper cut in the nearby theatre. India in the ascendancy, Yu Mengyu entered the arena; after a close first game against Madhurika Patkar, she asserted control (13-11, 11-2, 11-6). Next on the menu, the vital doubles; both teams stuck to the tried and trusted formula of previous fixtures. Mouma Das and Madhurika Patkar formed the Indian partnership, for Singapore it was Yu Mengyu and Zhou Yihan. The Indian duo captured the opening two games, the Singaporeans responded to win the third but in the fourth Mouma Das and Madhurika Patkar established a 6-4 lead, the Singaporeans called “Time Out”. There was no respite, at 10-6 it was four match points for India. The first match point was saved. Massimo Costantini called “Time Out”, the players returned, the return of service from Mouma Das clipped the top of the net, unreturnable, India held a vital lead. Enter centre stage Manika Batra and Zhou Yihan; following the same tactical policy as against Feng Tianwei, Manika Batra secured the first two games. In the third she went ahead 5-4, Zhou Yihan called “Time Out”. The move was necessary but not fruitful, Manika Batra playing at a whole new level, was not to be denied, at 10-7 she held match point, championship point, at the first opportunity she converted and danced in delight; a three straight games verdict was the outcome (11-7, 11-4, 11-7). 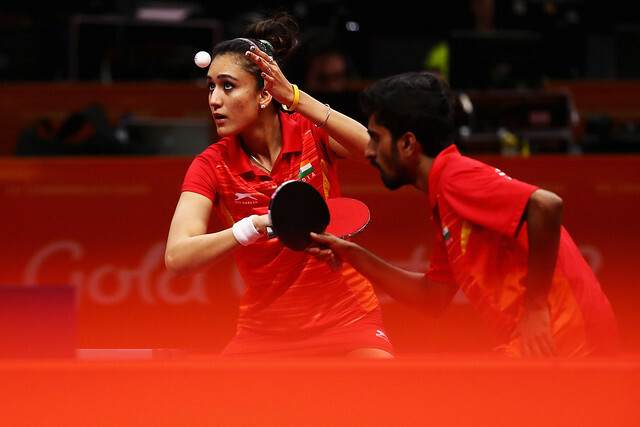 The sequence was broken; since table tennis was included in the Commonwealth Games in Manchester in 2002, it was the first time Singapore has not won gold; India had reached new heights, proud moments.